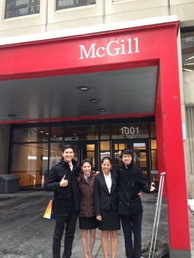 During March 17th � March 23rd 2013, the Thammasat University BBA Program has sent a team of students consisting of Attasith, Nichapat, Panisara and Vibhu to Montreal, Canada to compete in Mcgill Management International Case Competition hosted by Mcgill University. 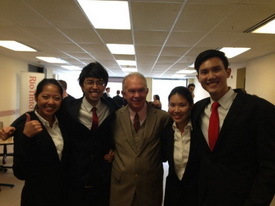 Competed against 11 other teams from over the world; Thammasat University was placed 3rd after Wharton School of Business - University of Pennsylvania and Belgrade University. The week began with many social activities that the committee has provided for participants to get to know each other. The activities include scavenger hunt around Montreal city and the famous snow tubing down the steep hills at Mont- Avila. All of us have enjoyed all of the experiences that this competition has to offer, and has developed ourselves personally and as a team. Lastly we would like to express our gratitude to our coach Arjarn James Fitzpatrick for his time and dedication to our team. All 4 of us, and the entire case team in the past 16 years could not be here without his support. Posted date: April 18, 2013 � 15:00 Hrs.